Incredible Years Basic Parent Group Leader Training! Last week we were happy to have a wonderful group of folks from all over the states come to Seattle for Parent Group Leader training! Carolyn Webster-Stratton trained the participants about how to implement the Incredible Years Parent Programs (for working with parents of children ages 2-8). During the 3 days of training, participants were provided with hands on experience in the form of role plays and practices. They collaborated together to develop principles for working with parents, recruitment strategies, and more! The Incredible Years holds regular group leader trainings in Seattle, WA for people interested in implementing our programs. See our “Workshop Schedule” for more information! 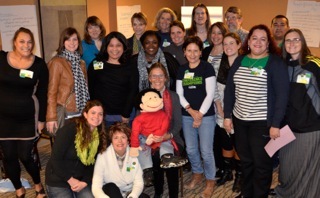 In the photo above, Carolyn leads parent workshop in Seattle, Jan 29-31, 2014. Participants represent multidisciplines including child psychiatrists, psychologists, nurses, social workers and teachers. They represent the following states California, Buffalo New York, Oregon, MA, New Hampshire, Hawaii, Kansas, Minnesota and WA. Carolyn is holding her Chinese puppet Fu (stands for luck) and is wearing a red scarf because it is the Chinese New Year. Categories: Incredible Years, Workshops | Tags: Group Leaders, Incredible Years, parent training, Parents, training, workshop | Permalink.